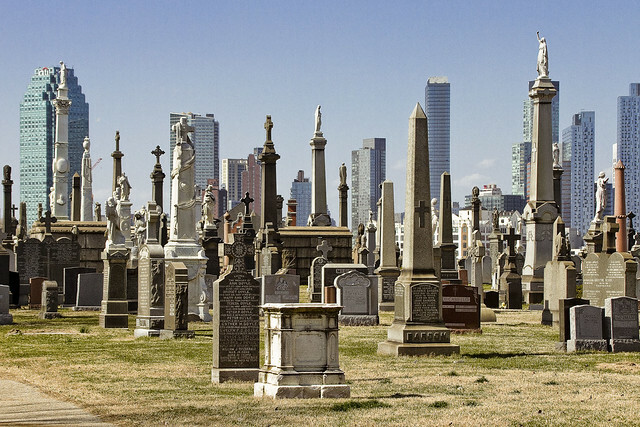 A long overdue visit to Calvary Cemetery, in today’s post. Consecrated by Archbishop “Dagger” John Hughes in 1848, who personally conducted the first interment (of literally millions) here in LIC’s Calvary Cemetery, this was and is the primary burying ground of the Roman Catholic Church in NYC. 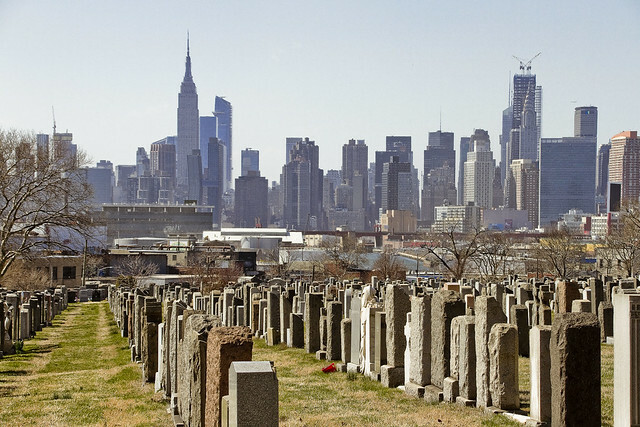 That first funeral was for an Irish immigrant named Esther Ennis, who is said to have died of a broken heart at her flat on Manhattan’s Clinton Street. Pictured above and below are views of the original part of the RC Church’s sprawling funereal complex, the “Saint Calixtus” or “First Calvary” division, found in the Blissville section of Long Island City. There are three other sections of Calvary, which are found nearby in the neighboring community of Woodside to the east. That large dome poking up through the bare tree limbs in the shot above is the Almirall Chapel, built in 1908. The dome is forty feet across, eighty eight feet tall, and is capped by a statue of Christ the Redeemer created by a sculptress named Merro Beatrice Wilson. Ms. Wilson’s gender is mentioned for a reason, as it’s a pretty extraordinary thing for the Roman Catholic Church of that era to have handed out such a prominent assignment to a female artist. Conversely, the New York Archdiocese of the late 19th and early 20th centuries was a very different organization than it is now, politically speaking. 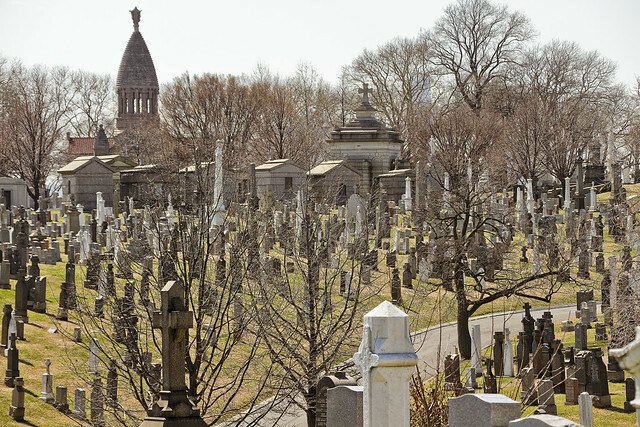 During the second half of the 19th century, it was not uncommon for Calvary Cemetery to handle anywhere between fifty and one hundred funerals a day. The chaplain of the cemetery, named Reverend Hennessy, lived in a house found on the northeastern side of the grounds along with his staff – who were apparently monks and young priests. Hennessy is also buried at the cemetery he devoted himself to, incidentally. His monument is white marble, adorned with delicate carvings depicting his priestly vestments. The monument hasn’t weathered well, what with the acidic rain and industrial pollutants produced by nearby factories found along the notorious Newtown Creek. Generally, marble in Calvary looks like melting ice cream, whereas granite seems to be fairly invulnerable to the atmospherics. Fashions come and go. Hemlines, sideburns, hairstyles etc. Same thing occurs with mortuary architecture. A fad or fashion which seems, evidentiary speaking, to have occurred between the 1870’s and about 1900 was to erect enormous obelisk markers for subterrene family tombs. There’s a plane of these obelisks, right in the center of the place. Hawks like to hang out on them, waiting for rabbits to pop up from underground hidey-holes. Looking roughly westward, towards Manhattan. You can just see Newtown Creek and the Pulaski Bridge peeking out from above the memorial stones. This particular section of the cemetery has been used as the set for dozens and dozens of television and movie funerals. Vito Corleone’s funeral happened to the east of this spot, nearby the Johnston Memorial, but this is where Spider Man’s Uncle Ben, Batman’s parents… i can’t even begin to list them all. By the way – Is it just me, or has the Manhattan skyline been utterly screwed up forever by Hudson Yards and that monstrosity going up behind the Chrysler Building? Not everything new that goes up in the City is too terrible. I was admiring 53W53 across the river this morning from the tunnel approach. Like so many things it’s beautiful to behold from afar, but decidedly less pleasant to be planted within the shadow thereof. yup, staying out of that one I am.